The Resources section is where important resources that ALL users can access if given permission to the Resources module. Some users will be given access to be able to upload new and remove existing resources. The following steps outline how to Manage the Resources in the My Resources Page. It also includes information on how to add a resource into a folder. Click on the "My Resources" button on the Home Page. If a user has access to manage the resources, they will have a separate "Upload New Resources" window on the top right of their My Resources page (as shown here). #1: Click on the Manage Resources link to be taken to the management page. All of the existing Resources willl be displayed. To Edit or Delete a Resource click on the required button. To Edit or Add an existing Resource into a new Folder, click on the "Edit" button, or click on the name of the resource (e.g. 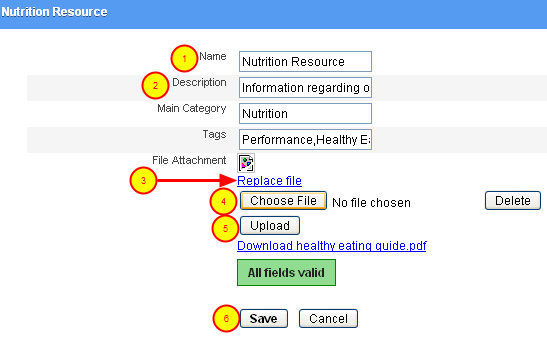 Nutrition Resource), then the Resource can then be edited (as shown in the step below). - Click "OK" to delete it from the system. - Click "Cancel" to cancel deleting it from the system. #1, #2: To make any changes to the Resource Name or Description, type directly into the text box. #4: Click Choose File, to search through the list of files on your computer. Select and Open the file. #5: Click Upload to wipe the existing file and upload a new file. To Add the File to a Folder or sub folder see the step below. You can group resources together into folders by typing in the name of the folder into the "Main Category" text box area. In the example here, the Main Category folder is called "Nutrition". This resource will now be linked to the "Nutrition" Folder on the My Resources page. You can only type in one folder name in the Main Category text area. N.B. MAKE SURE YOU TYPE THE FOLDER NAME CORRECTLY. You can specify other files to have "Nutrition" as their Main folder, but if you type in nutrition instead of Nutrition (with a capital) two separate folders will appear. You must type it exactly the same for all files that you want to include in a specific Folder. Tags allow you to add the file/resource into a sub folder of the Main Category folder (see the step below). 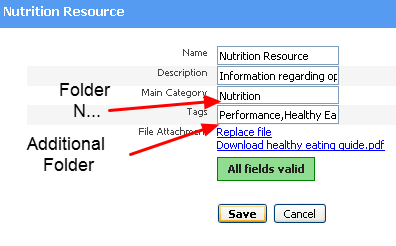 Tags also allow you to type in the name of another Main Category folder like "Performance" so that the file will appear in the Performance sub folder of Nutrition, as well as appearing in the Main "Performance" folder. Simply type in the name of the folder and/or sub folder into the Tags text box. You can add in more than one sub folder but make sure you separate the sub folder and/or main folder names using a comma. Do NOT put a space between the folder names, just use a comma. A space can be included as part of the folder name e.g. Healthy Eating (as shown in the image here). N.B. MAKE SURE YOU TYPE THE FOLDER NAME CORRECTLY. You can specify other files to be in the "Healthy Eating" sub folder, but if you type in healthy eating instead of Healthy Eating (with a capital) two separate sub folders will appear. You must type it exactly the same for all files that you want to include in a folder and/or sub folder. The image in the step below shows the folders and sub folders. The Folders and sub folders appear as they have been previously set up. To add a resource into an existing or a new file simply type the file name in the Main category text area as shown in the image in the previous step. To Add a New Resource, click on the "Create New Resource" on the right of the Resources List page. #4: Browse through your computer files. The Resource will be added to the Resources list. The New Resource will be shown on the Resource List and will be available on the My Resources Page for users to download (as shown in the step below). The new Resource is available to download. 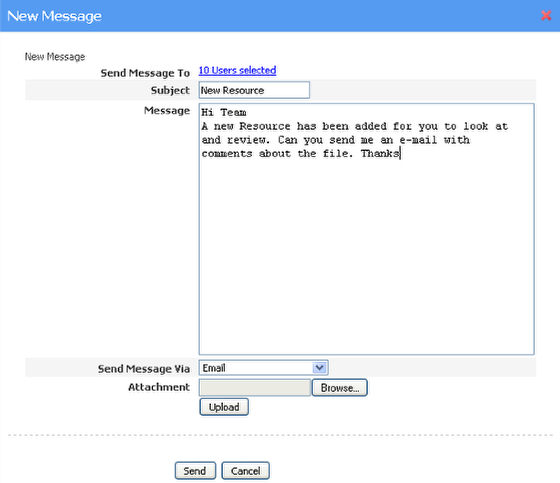 -Send Message Via: Check that you want this e-mail to go to the users external e-mail account (e.g. xtra, hotmail or g-mail).